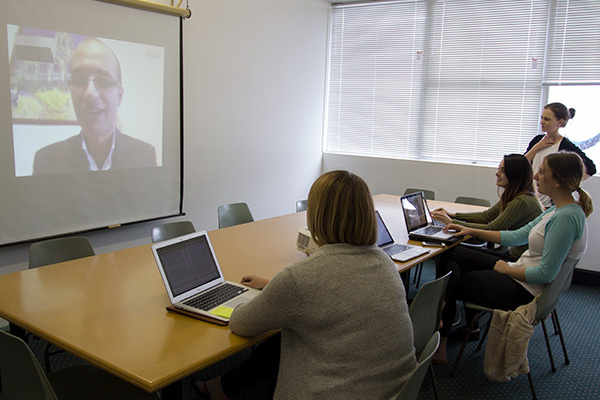 Five international academics helped teach a unit about literary movements of the 20th century this past semester thanks to an Avondale lecturer’s use of videoconferencing. Drs Steve Cramer, Mehdy Sedaghat Payam and Josh Roiland and Professors Tony Simoes da Silva and Jane Stafford from tertiary institutions in South Australia, Iran, the United States, Tasmania and New Zealand each explored texts and examined critical theories with Global Voices students in lecturers delivered via Skype. Morton chose new texts—the novel The Glass Palace by Indian Amitav Ghosh, selected non-fiction by American novelist, short story writer and essayist David Foster Wallace and selected short stories by New Zealander Katherine Mansfield—in addition to those she had already been teaching. Then she asked colleagues from around the world to present a lecture and lead discussion. Ania Mitchell is a Bachelor of Arts/Bachelor of Teaching (Secondary) student majoring in English at Avondale College of Higher Education.